Computer Aid is aiming to bring offline access to educational websites to areas with limited internet access. 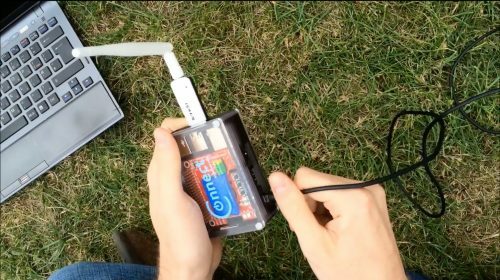 Right now, it’s turning recycled Raspberry Pi boards into portable internet hotspots. “It’s for offline students and teachers across the world,” said Nicola Gampell, E-Learning and Marketing Officer for Computer Aid International. As a result, Connect will “bring them a local internet full of educational resources, ranging from scientific simulations to Wikipedia articles,” Nicola told us. Computer Aid’s ‘Connect’ device provides offline classrooms with a wealth of educational resources. “The Raspberry Pi is a key component of the device, especially due to its low power usage and low cost,” said Nicola. The Raspberry Pi is placed alongside a 64GB SD card and a Wireless N150 High-Power USB Adapter. Visit the Computer Aid website if you’d like to donate a Raspberry Pi board to the project. Just skimmed the article, but what is a recycled RPi? This charity is using people’s old Raspberry Pis to set up these networks in the developing world. There’s a link at the end showing you where you can donate. Where is the internet coming from to begin with? I see there is a wifi antenna for broadcast… So I’m guessing the internet is provided via 2/3G? It’s a local network: it’s not the whole internet, but a locally hosted set of resources like all of Wikipedia, Khan Academy, a lot of literature, medical and other textbooks, training materials, educational resources etc. – all of which can be tailored to the community it’s going into; and of course it means everybody in the community can now connect to everybody else. Follow the link to RACHEL-pi in the article to learn more. Ooh good one. Now I know where to ship my old Pi’s instead of the ol’ dust bin. Great initiative, like the idea even more for localized resources, could be applied to many different community projects. He describes it as the useful 3% of the Internet. We all need an offline wikpedia (RACHEL Pi) – ready for the zombie apocalypse ! Great! This is really a good and amazing device. That sounds great! In our western world we can’t imagine a world without internet anymore and in schools it’s already standard for learning. It’s about time that people in remote areas can get at least a glimpse at it as well. One day they can might use it as a learning resource as well. We think this is one the best projects in the world. That’s why Mythic Beasts donated them all the bandwidth for people setting up RachelPi servers.